Recently we saw some hands on images of alleged Oneplus 6.In that images we had seen notch on its display.Now new reports from XDA confirms that it would have notch on display.Recent weeks,we are seeing that many manufactures launching new devices with notch display,while Apple plans to discontinue. 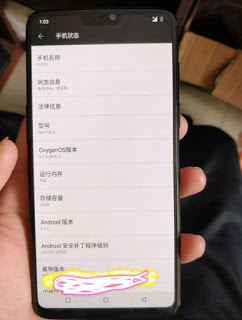 The XDA teams discovered that chances of notch display on upcoming Oneplus 6 while checking Oxygen Os open Beta4 firmware file.They also assumed that Oneplus 6 will be code named as 'enchilada'. Few days back its Antuntu score were also leaked and scored a good number.The phone would come with Snapdragon 845 processor and 6 and 8 GB RAM variants.Though other features are still in mystery,it is expected to have 20 MP camera and dual camera set up on rear.I am looking that will Oneplus introduce variable aperture in Op 6 like S9 series.